Neck pain seems to plague America, because every few years a new pillow emerges which claims to cure neck pain and eventually sleep problems, yet Americans complain of the prevalence of the same issues. People need knowledge of the many pillows, of which is right for them, and of how to use them. According to the National Center for Health Statistics (NCHS), approximately 76.5 million Americans twenty and over report to have experienced pain (excluding acute pain) for twenty-four hours or more. Neck pain was fifteen percent of the experienced pain, but according to the American Osteopathic Association (AOA), near every other American thinks pain a part of life, and forty-one percent think it a part of aging. It doesn’t have to be. Feather: Feather pillows are soft and plump. Although these pillows are normally soft, they do have different levels of firmness. These pillows can harbor dust mites, and last for some time. Especially the down, these pillows provide good support, but a potential buyer must first base his or her choice off the neck support desired. Down: These pillows have the plumage of geese and duck. If the pillow contains more than seventy-four percent of the plumage (with less than twenty-five percent feathers), it’s a down pillow. They can smell, and don’t fare well with large people. They are soft and provide comfort and neck pain relief. Plumage falls out of the case from time to time, because of plumage, they should be dry cleaned, fluffed regularly, and may be harmful to those with allergies. Overall, the rich plumage makes this pillow expensive. Down Alternative: These are from fibers that give the feel of down feathers without the allergies. They are machine washable, and may become lumpy at times. Down alternatives are inexpensive, and provide adequate support. They’re moveable, have no odor, and accommodate any sleeping position. Like the feather, there are varieties, so support for large people varies. Fiber: Fiber, or microfiber or fiber filler or polyester, pillows are inexpensive but last only a few years, if even to that extent. They flatten easily and can harbor dust mites. 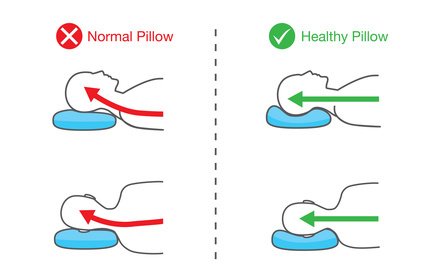 Since they compress and are lumpy, polyester pillows don’t support the neck well. They’re not costly, but you must buy many to have any support, increasing overall price. Latex: Latex pillows don’t provide a habitat for dust mites. They’re firm and bouncy, if you can bear their spring, they’ll support your neck well. They last many years, because of their firmness. They don’t make noise as a person moves around at night, and their contents don’t move, which make them easy to maintain. Although they may have a rubbery smell, that dissipates in days. 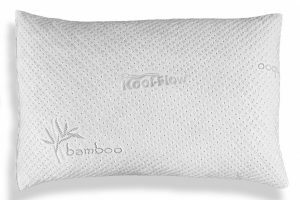 Latex pillows are heavy and pricy compared to fiber, feather, and down pillows. 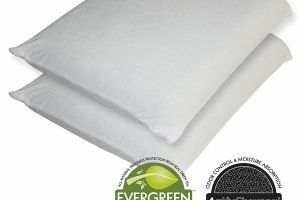 Memory Foam: In the 70s NASA invented this material for cushions, but later they were found to have commercial uses, too. 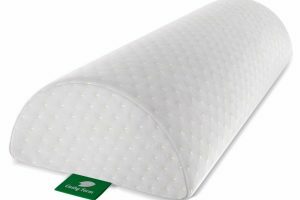 Memory foam shifts according to the sleeper’s position, providing adjustable support. Therefore, latex and memory foam are in great competition because of the neck pain relief they both offer. Memory foam is heavy and has a chemical odor which normally dissipates. For some, it’s too heavy, but it comes in two forms: shredded or one-piece. Water: Water mattresses are heavy, but they’re firm and do support well. Although they may make noise because of the water, which must be changed yearly, some have had their neck pain relieved by this pillow. They can shift, like memory foam, and adjust to the head’s position. Because these pillows are of water, they have no smell; since one cannot break water and the casing is firm, these pillows are for all sizes. 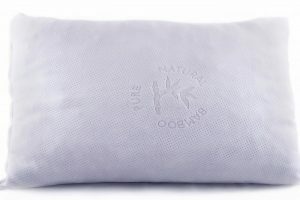 Overall, the water pillow is nearly the same as the memory foam or latex. Buckwheat: Buckwheat pillows consist of buckwheat hulls and husks covering buckwheat kernels. The hulls are small and usually hard. Depending on the pillow, the hulls come either flattened or full. The flattened, or crushed, hulls are less noisy than the full ones. Since flattened ones are already flattened, pillows like this cannot be compressed, whereas pillows of intact ones are apt to compress. On the other hand, the full, or intact, hulls allow for air circulation and are dust free. This type of pillow is expensive, but not without benefits. Many report to have had pain relief while using buckwheat pillows; the pillows reduce snoring. They’re supportive and firm, but heavy and practically immovable, so if sleeping on one side, be ready to stay there for the night. Although they don’t support much movement, they are good for any position – back, side, or stomach. Causing little allergies, Buckwheat pillows are durable but after spending much time breaking them in. In addition, they’re difficult to wash. Nevertheless, if cared for well, these pillows on average satisfy the need for a good night’s sleep. 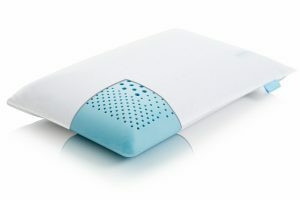 Traction: The traction pillow exists for those with herniated discs, a problem which at times causes severe pain, and general back pain. No general formula for these exists. Many pillow companies have many varieties. The best sleeping position is on the back; the worst on the stomach. Those that sleep on the stomach should place the pillow under the chest for support, but usually this person does not need a pillow. The pillow should be under the head of the person who sleeps on their back. The same goes for those who sleep on the side. When someone is sitting in bed, he or she should sit straight so as not to develop a hunch. The pillow should be at the back to prevent the wall from hitting the back. Large persons should find a firm pillow. Neck pain can subside by just a change in pillows and how it’s used. The consumer can decide whether he or she wishes to end the pain through great products or prolong it with mediocre ones.